First published in 1656 and introducing the so-called second Sanson model of California as an island. This depiction shows a small peninsula (Agubela de Cato) above the island, two bays along the island's northern coast and two new place names, Tolaago and R. de Estiete. Sanson actually based this on information from the less well known map by Luke Foxe, but it was this map that influenced many other cartographers throughout the rest of the century. 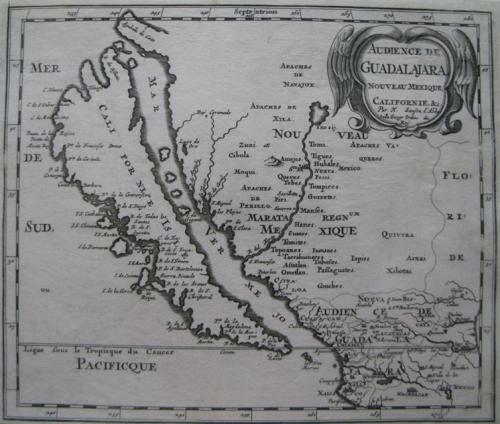 On this version the name Nouvelle Albion appears in the northern part of California. On the mainland there are new Indian tribes identified in the region of the R. del Norte, which flows southwest from a large inland lake, and two large clusters of mountains are shown pictorially. This issue is from a re-engraved plate published by Joannes Ribbius and Simon de Vries. A strong print in very good condition, with a small repair (1 cm) to the top margin.